The working group brings together researchers from all over Europe (and beyond) who meet regularly and exchange on their work. The working group offers a platform to create stronger synergies, seek collaboration opportunities and develop specific (and adequate) conceptual and methodological frameworks in the field of collaborative housing. Dr Darinka Czischke elected for the ENHR co-ordination committee!! Dr Darinka Czischke was recently elected to become a member of the ENHR co-ordination committee. As a long-standing member and active participant in the network, Darinka deeply values its unique place in the international landscape of housing research, and believes it is very important to keep it alive and build on its strengths while at the same time breeding innovation and fresh approaches into it. 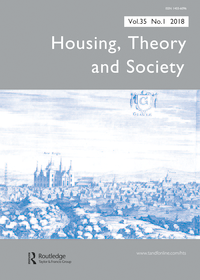 Among other goals, she will focus on expanding the participation opportunities for early and mid-career researchers in the decision structures of the network; strengthening the external visibility, recognition and position of the ENHR in societal and policy circles internationally; and encouraging the inclusion and debate of innovative, experimental and possibly disruptive approaches in to housing studies, both theoretically and methodologically. For the third consecutive year, the ‘Collaborative Housing’ was one of the ENHR working groups with the highest number of participants. With participants coming from all over the world, the group had the opportunity to learn from the different initiatives of Collaborative Housing in Japan, Denmark, Spain, among others. Darinka Czischke, together with other members of Co-Lab Research, namely Carla Huisman, Jasmine Palmer and Sara Brysch also had the chance to present the recent advances on their research projects.